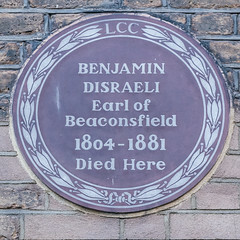 Benjamin Disraeli, 1st Earl of Beaconsfield, KG, PC, FRS (21 December 1804 – 19 April 1881) was a British statesman and writer who twice served as Prime Minister. He played a central role in the creation of the modern Conservative Party, defining its policies and its broad outreach. Disraeli is remembered for his influential voice in world affairs, his political battles with the Liberal Party leader William Ewart Gladstone, and his one-nation conservatism or "Tory democracy". He made the Conservatives the party most identified with the glory and power of the British Empire. He is the only British Prime Minister of Jewish birth. Disraeli was born in London. 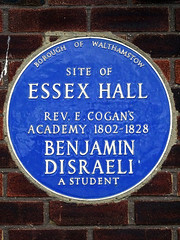 His father left Judaism after a dispute at his synagogue; young Benjamin became an Anglican at the age of 12. After several unsuccessful attempts, Disraeli entered the House of Commons in 1837. In 1846 the Prime Minister, Sir Robert Peel split the party over his proposal to repeal the Corn Laws, which involved ending the tariff on imported grain. Disraeli clashed with Peel in the Commons. Disraeli became a major figure in the party. When Lord Derby, the party leader, thrice formed governments in the 1850s and 1860s, Disraeli served as Chancellor of the Exchequer and Leader of the House of Commons. He also forged a bitter rivalry with Gladstone of the Liberal Party. Upon Derby's retirement in 1868, Disraeli became Prime Minister briefly before losing that year's election. He returned to opposition, before leading the party to a majority in the 1874 election. He maintained a close friendship with Queen Victoria, who in 1876 created him Earl of Beaconsfield. Disraeli's second term was dominated by the Eastern Question—the slow decay of the Ottoman Empire and the desire of other European powers, such as Russia, to gain at its expense. Disraeli arranged for the British to purchase a major interest in the Suez Canal Company (in Ottoman-controlled Egypt). In 1878, faced with Russian victories against the Ottomans, he worked at the Congress of Berlin to obtain peace in the Balkans at terms favourable to Britain and unfavourable to Russia, its longstanding enemy. This diplomatic victory over Russia established Disraeli as one of Europe's leading statesmen. World events thereafter moved against the Conservatives. Controversial wars in Afghanistan and South Africa undermined his public support. He angered British farmers by refusing to reinstitute the Corn Laws in response to poor harvests and cheap imported grain. With Gladstone conducting a massive speaking campaign, his Liberals bested Disraeli's Conservatives in the 1880 election. In his final months, Disraeli led the Conservatives in opposition. He had throughout his career written novels, beginning in 1826, and he published his last completed novel, Endymion, shortly before he died at the age of 76.